Follow these design strategies, and a small eating area will feel twice its size. Consider yourself lucky if you have a spot in your home to dedicate to entertaining—even if it’s just a corner of your living room with a small table and chairs. While you may not have the space for a 10-person book club potluck, these smart design strategies and decorating ideas will help you create a more open and inviting dining room to enjoy with small groups of friends and family. Try these tips to maximize your eating area so you won’t have to edit the guest list. Instead of bulkier dining chairs, a bench provides more seating and can be tucked under the table or pushed flat against the wall when it’s out of use. If you don’t have the room for a traditional-sized table in your small dining room, don’t force one into your space. Try an unexpected surface like an outdoor bistro table or narrow desk that won’t overcrowd the room. The addition of unusual dining chairs, like space-saving wire stools or an upholstered bench, puts a new spin on a room that tends to lean traditional. We know this is usually a no-no in the design world, but if you’re seriously lacking square footage in your eating area, try rearranging the furniture so the dining table is pushed against the wall to maximize the utility of the room. You can always pull it out when you host a bigger group. It’s not often you’re told to put something oversized in a small space, but the one spot to go big is with artwork. Large art grabs people’s attention away from the room’s imperfections and fills the vertical space so it gives the illusion of taller ceilings. It’s also a great jumping off point for the style and color scheme of the rest of your décor. City dwellers are far too familiar with eating at a coffee table, but a wall-mounted drop-leaf table may just be the answer to your no-dining room troubles. Build it yourself, or try one like this from IKEA that folds down when it’s not in use. Folding chairs hung on the wall are easily accessible without eating into your tiny floorplan. There’s a reason you’re constantly being told to hang a mirror in a small space. Reflective surfaces create a sense of depth and disperse light to make a cramped room feel bigger. If you’re tired of the mirror trick, try a reflective sideboard or bar cart to get the open feeling. Picking a wall color for your dining room can be overwhelming. Should you go all white? Dramatic navy? Airy light blue? While lighter tones tend to be a more popular choice in smaller spaces, you also want to consider the amount of natural light and the design aesthetic. 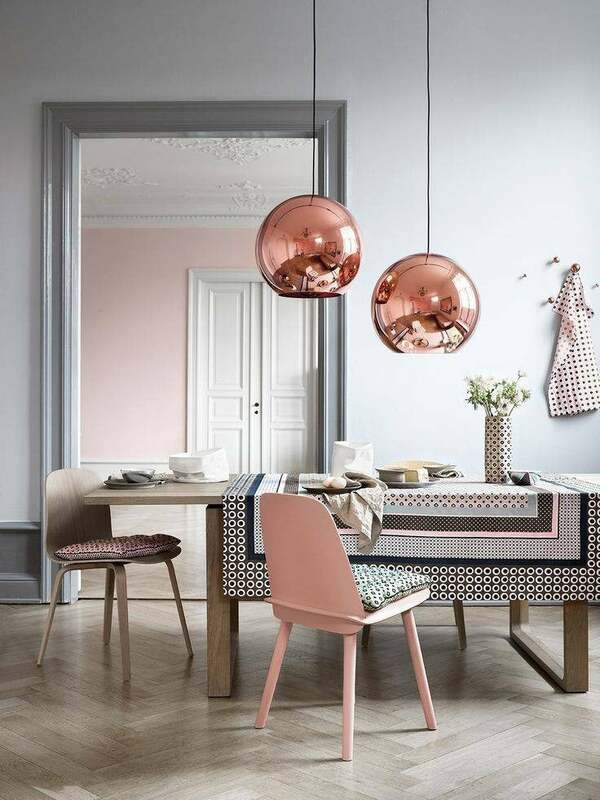 To learn how to pick the right paint color for your dining room, consult this trusted advice. If your dining area is part of an open floor plan, a statement-making rug helps section off the entertaining space from the rest of the room so it’s easily distinguishable. In addition to anchoring the space, a rug adds much needed contrast to balance out the hard, smooth surface of a dining room table. To find a rug that suits your home and decorating style, use this helpful guide. Eye-catching decorative accents, like candlesticks or floral arrangements, are a small-scale way to give your dining room a fresh update. Try an arrangement of leafy branches that extend upwards; it will help create the sense of more space. When it’s time to entertain, don’t overcrowd the table with individual placemats that bring attention to the size of the tabletop. Instead, drape the table with a cloth, and you’ll be able to squeeze in an extra table setting. No room for a china cabinet? Instead, take advantage of the vertical wall space with open shelves to store your fancy dishes or collection of vintage servingware. Not only does this create storage space, it also packs a visual punch without overcrowding. If you need some inspiration, take a look at this stunning DIY of built-in open shelves from The Wood Grain Cottage. Carve out a nook in your open concept living space by utilizing a corner of the room as a spot for guests to gather around the table. A built-in “L” shape banquette with a round table creates a cozy conversation area with ample seating. Curtains hung all the way up to the ceiling elevate a room’s height. But be sure not to choose heavy fabrics that can make a room seem cave-like. Stick to sheer materials that guarantee light will flow through for a more open, lofty feeling. Swap out a clunky chandelier for something sleek with clean lines to help tailor the space. Crisp and chic, Lucite chairs will make the room seem twice its size. The transparent furniture instantly opens the dining area where a solid piece would take up lots of visual space. Vertical lines emphasize the height of your dining room. Floor-to-ceiling shiplap or halfway wainscoting enhance a modern country feel—even if you don’t have your dream farmhouse table. If you don’t have wall space for a drop leaf table, and a small round option is out of the question, see if a slim table pushed up behind your sofa is the magic setup. Opt for something that doesn’t run the full length of the couch so dining chairs can go at both ends without cutting into the walking path. If you already own a console table, take off those decorative lamps, and use it as a makeshift dining table with stools tucked underneath.